Inject a little life into your latte or cup of cappuccino with this fantastically simple battery operated Schiuma Milk Frother from Bodum. Crafted of stainless steel for maximum durability, the Schiuma Milk Frother features a flexible spiral frothing tip that can turn any milk or cream into a luscious whip. The frother easily turns on and off with a smooth, inlaid button. Bonus: Bodum's Schiuma can also be used for an array of non-coffee whipping purposes, such as salad dressings, eggs or milk shakes! 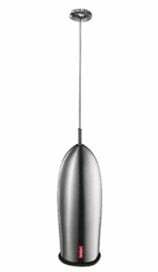 Simple - There are only a few steps to remember when using this frother. Simply place it in the milk and let it run until you've got the whip you want. Not a Milk Heater - The Bodum Schiuma Milk Frother will whip your milk, but it does not heat it. Hand-wash between uses with light soap and water.